Paint chips are usually found at home improvement stores, packed into a small herd and fanned out for customers to peruse and take home at will. Someday, some of them may dictate the exact hues of our most intimate spaces -- our bedrooms, our kitchen walls, our bathroom ceilings. But until then, they float in a strange space of indeterminacy, free of cost and packed with potential. 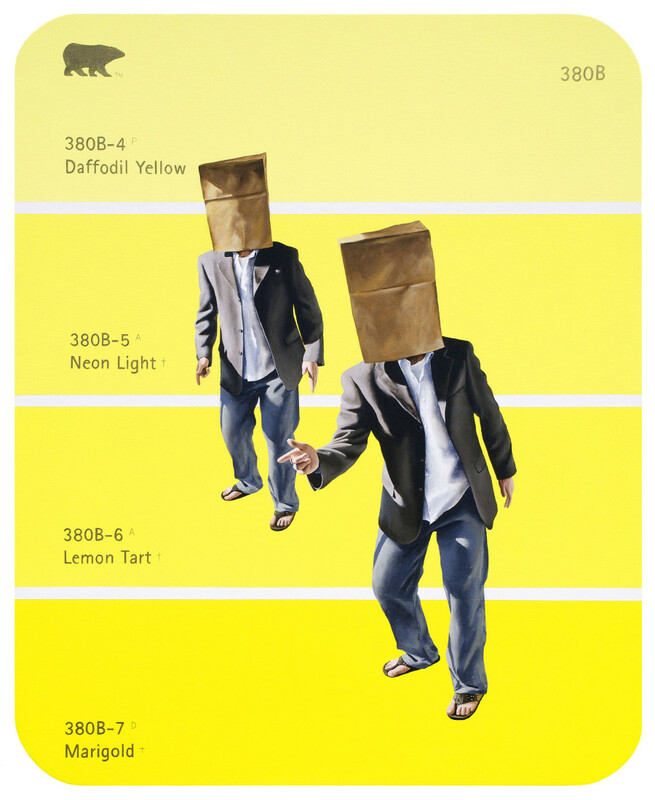 Denver-based artist Shawn Huckins found unlikely inspiration in these mundane color swatches. He first stumbled upon their beauty while working on an experimental painting. "I was having difficulties figuring out which color tone to use for the background," he said, "so I taped some Behr paint cards to the canvas to help me in the process. Seeing the cards attached to the canvas was an interesting contrast with the subject matter. I thought, what if I took that paint swatch, blew it up to a large scale and placed the subject within the color fields?" And that's exactly what he did. Huckins creates exact replicas of the original paint chips, blown up to canvas-size proportions. Everything, from the rounded corners to the text style on the swabs, is duplicated. "Typically, I choose the color first and compose which colors work best in a group, trying to avoid muddy or grayed out hues," Huckins explained. "Once I have a few paintings completed with the color fields, then I research and figure out subject matter to place on top of the color fields. With most 'Paint Chip' paintings, I’ll choose my subjects based on the color of the swatch. For example, '490A -- Flight,' the crisp blue of winter’s sky or in '390B -- The Peeker,' the heat of the desert sun." The results are what Pantone nerds -- yes, they're out there -- dream about. Color swatches, larger than life, finally amplified to a size comparable to the space they take up in our hearts. If you've ever passed by a basket of free color swabs without a second thought, let Shawn Huckins show you the beauty you've left behind. "With this particular series, I wanted to communicate the mundane and the beauty that can be found in it. We can be so caught up in the day to day routines, that it’s easy to forget the simpler, beautiful things, even in the mundane."